Enter Over the last 24 years, our long distance race has evolved into a well-balanced test of sailing and racing skills, attracting top national helms as well as experienced club racers and international entries. Laid out in hub and spoke format, with each leg returning through a gate near the club, the full course covers 85 kilometres in estuary, coastal and open sea conditions, and provides racing at all points of sailing. 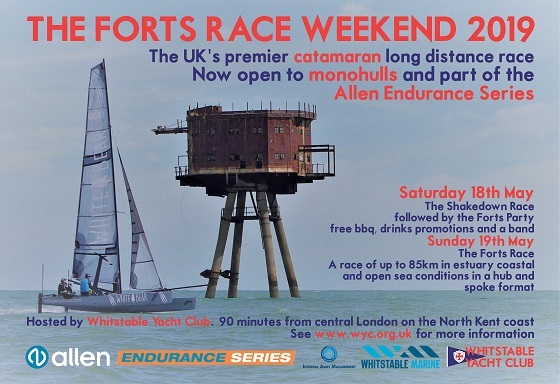 The flexibility of this format differentiates the Forts Race from other marathon events. It can be shortened for all competitors if winds are light. It can be shortened for smaller boats, to provide similar duration of racing. The course can be changed if conditions change. The risk of cancellation is reduced as it is easier to manage. Competitors can retire on passing through the gate each round. Support craft can be rapidly re-deployed where needed in emergency.